The Ace Hotel and Swim Club is retro as retro was meant to be. Its decor is so spot-on. It's not kitschy. It's not overly colorful. But it's just how it probably was, back in the day. And as such, this Palm Springs venue is a wildly popular place for swimming, vacations and, of course, weddings. This couple had their wedding ceremony at a charming venue called The Willows, but the moved their guests to the Ace Hotel for their reception. The Ace has a wonderful metal sign in its front drive, which I used for this portrait. The weather in Palm Springs is super-hot in the summer, which is when this wedding took place. But despite the heat, you didn't hear one complaint out of bride or groom. They were just too happy to be marrying one another. 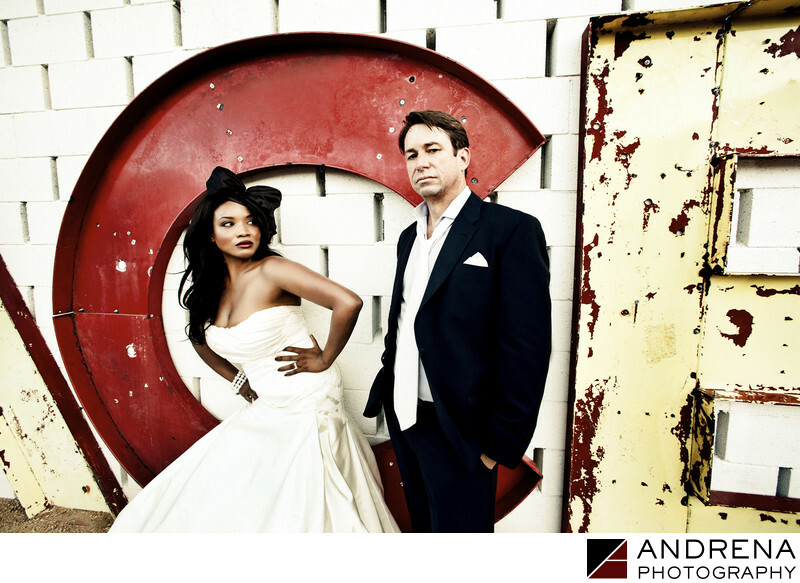 I took many happy portraits of this couple, but we all loved the attitude in this image. Wedding photographed at the Ace Hotel and Swim Club in Palm Springs.